When I need comfort food, I usually turn to Thai food for some reason. I think curry dishes lull me into a savory warmth that invoke good feelings but funnily enough, I was only exposed to the cuisine a few years ago. I have tried to make Thai green curry from scratch in the past and realized that it takes a while. No wonder a lot of people use the paste one can buy in stores. There is another option too though and that is a powder form that becomes a paste when mixed. With some red Thai curry powder on hand from Savory Spice Shop, I put together a soup made rich with duck broth but which can easily be made vegetarian with a stock adjustment. 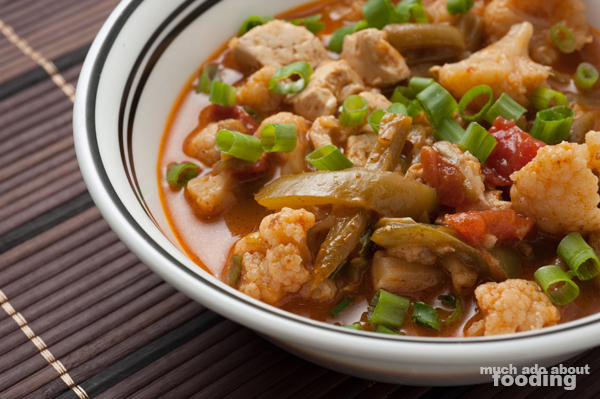 It is hearty, full of healthful vegetables, and easy enough to make with help from the powder. I hope you give this recipe a shot! 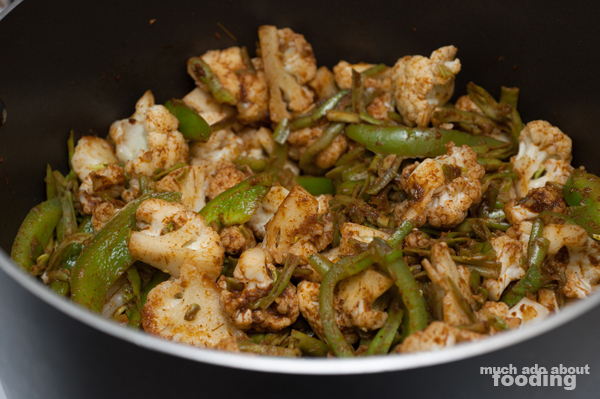 In a small bowl, combine curry powder, water, vegetable, and fish sauce (if using) into a paste. In a large pot on medium heat, coat bottom with oil of choice until shimmery. 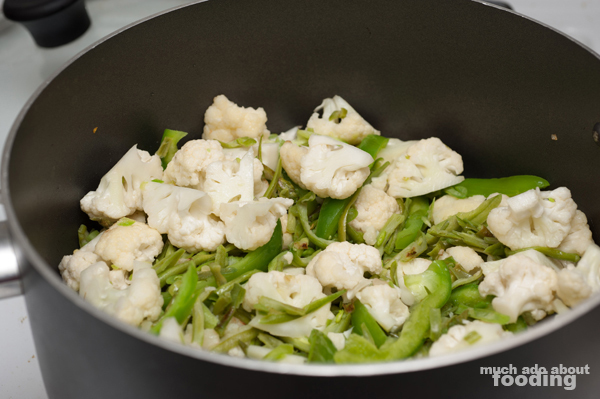 Add in cauliflower florets, green beans, bell pepper, and whites of green onions. Cook until bell pepper starts to become translucent. Then add in curry paste to coat and chili powder. 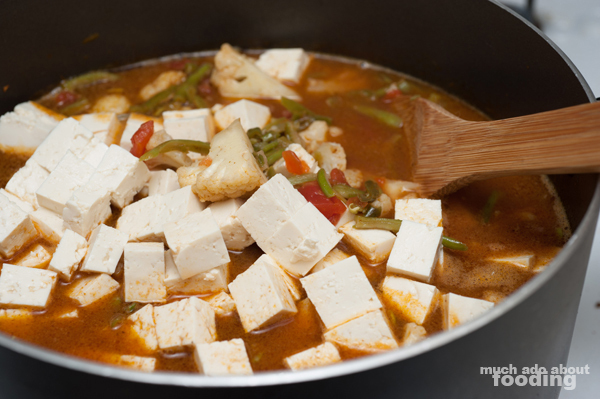 While waiting, press tofu under something heavy to squeeze out excess liquids. 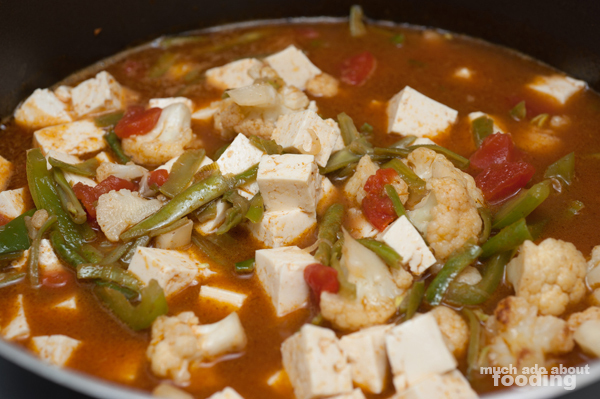 Add in cubed tofu, tomatoes, and duck (or vegetable) broth. Bring to a boil. 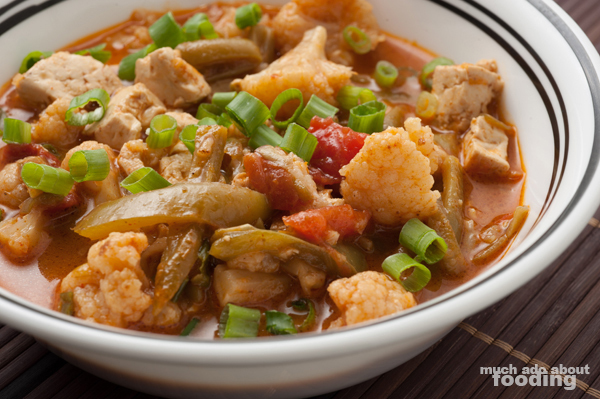 Once the soup has boiled, reduce to a simmer for 15-20 minutes. Top off with green onion greens. 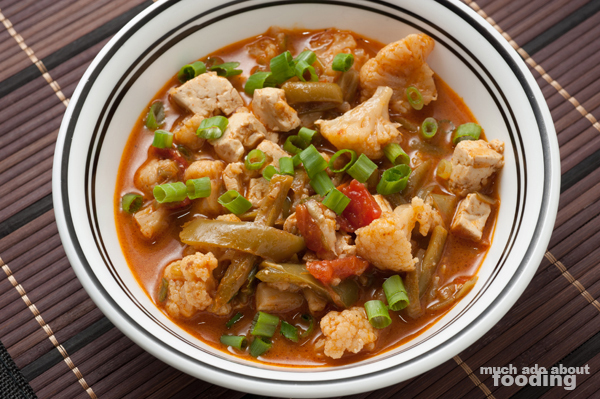 Remember that this is a soup, not a curry, so it will be watery and not thick like a curry.